We discuss what little information we have about the secret grand jury and speculate about other factors that might be affecting the timing of the Manning subpoena. We also talk about the wild political flip flops of the Left and the Right on the subject, about Julian Assange and Wikileaks publications before and after the 2016 election. We toss around some ideas on how the Trump-Russia investigation (aka Russiagate) might factor in. 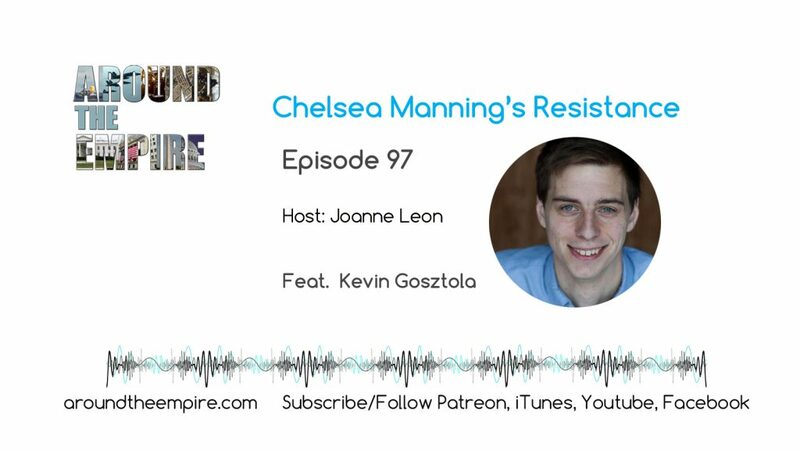 Finally we discuss how Manning’s well being and her health related needs, especially given the history, are the most important priorities and foremost in our minds. FOLLOW Kevin @kgosztola, find his work at shadowproof.com, and subscribe to his podcast Unauthorized Disclosure. Around the Empire is listener supported, independent media. Pitch in if you can at Patreon: patreon.com/aroundtheempire or paypal.me/aroundtheempirepod. Find all links at aroundtheempire.com. SUBSCRIBE on YouTube. FOLLOW @aroundtheempire and @joanneleon. SUBSCRIBE/FOLLOW on iTunes, iHeart, Spotify, Google Play, Facebook or on your preferred podcast app. Recorded on March 11, 2019. Music by Fluorescent Grey.